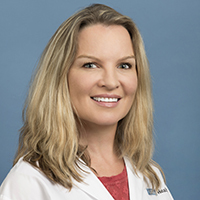 Dr. Laura Conley is a primary care physician who practices at Toluca Lake Health Center in Burbank. She is board certified in family medicine, and her clinical interests include dermatology, pediatrics and women's health. Dr. Conley is a Southern California native, who received her medical degree from the University of California San Diego School of Medicine. She then completed her residency in family medicine at UCLA, and has stayed on at UCLA ever since. She also completed her undergraduate studies at UCLA. When she’s not working, Dr. Conley enjoys art, crafting, hiking, and most importantly, raising her two boys.